It's that time of year again, when graduating highschool students are taking their university entrance exams. Entering the exam hall they're ready with their pencils, their erasers, and their... 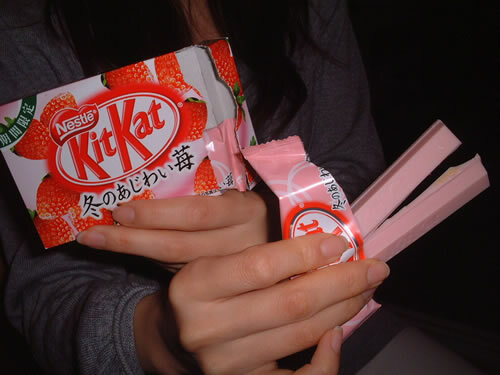 Kit Kats...? 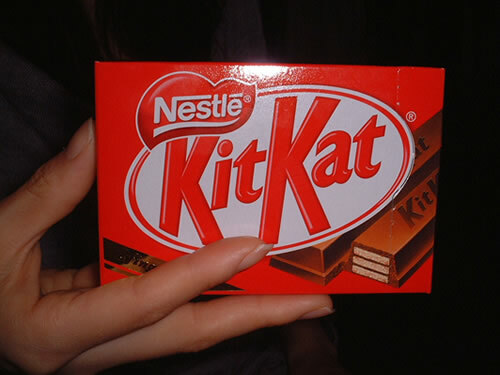 How did Kit Kats make it into the educational system? Well, when you translate Kit Kat into Japanese it ends up sounding like 'Kitto Katsu' which just happens to be the same way you say 'to certainly win', or in the case of students taking their exams, 'I will certainly pass this test'. Henceforth, students began regarding Kit Kats as good luck charms when taking their tests and the people at Nestle got down on their knees and thanked God for the beauty of linguistic misinterpretation. Ironically though, another reading of Kit Kat is 'Kitto Katto' which means, 'to certainly be cut', or in the case of tests, 'to fail'. 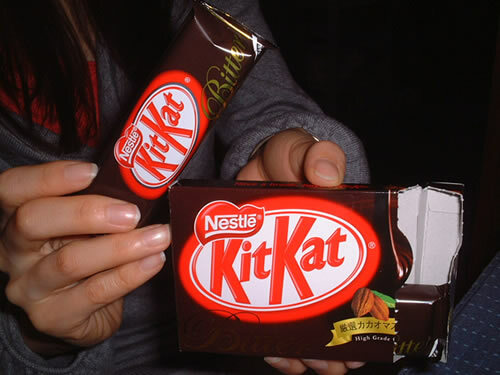 However looking at the popularity of Kit Kats in Japan, it's obvious that the marketing geniuses at Nestle ironed out that little detail. Not as obvious was the fact that the plain old chocolate Kit Kat wasn't going to cut it all by itself. 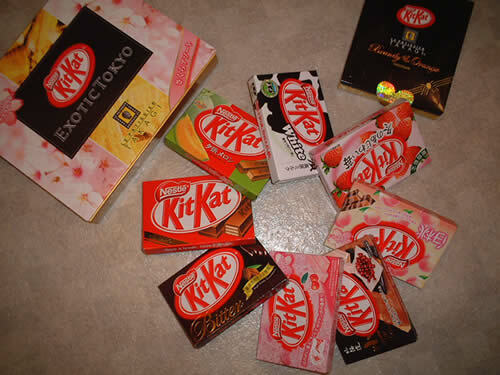 To date, Japan has produced about 45 different versions and flavours of Kit Kat, most of them exclusive to Japan itself. What gives? In Canada, you can't even count the number of different chocolate bars that are being sold in convenient stores, but for some reason, only a few of them made it to Japan. Snickers, M&Ms, and Kit Kat are the top three, and out of those three, Kit Kat is the clear winner, being available in almost every supermarket and convenience store you set foot into. I made an effort to collect as many flavours as I could in order to test them. However, I was foiled in getting them all simply because most of the flavours are only available for a short time then disappear. I did however manage to get 10 of them. So is the original Kit Kat going to be irreplaceable or is one of these upstart flavours actually going to be worth something? We'll start with the original because it is the standard by which all other Kit Kat flavours must measure themselves. Therefore it will automatically be given a rank of zero. In the unlikely chance that any other flavour is better it will receive a positive ranking, if worse, a negative one. My lovely hand model and assistant, Kumi, will also be giving her opinion. Everybody clear? Alright it's time for a break! Quite a lot of them actually. The flavours I managed to find not including the original, are as follows: peach, strawberry, melon, white, bitter, cherry, red bean, brandy & orange, and exotic Tokyo. Peach was first on the list. Upon opening the package we are assaulted by a strong peach smell. It wasn't a good smell though, more like the smell of cheap peach perfume. The Kit Kats themselves had wispy white lines going through them. Not sure what effect this is supposed to give but it didn't impress me. Despite the smell, we agreed that it still tastes pretty good, however this might be because we're both hungry. Next is Strawberry. As you can see it is pink which to me is an automatic minus. 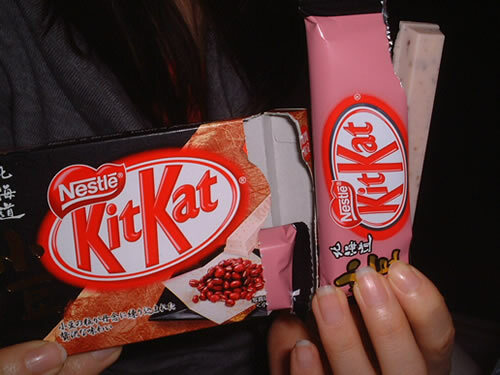 Chocolate should not be pink. Smell wise, it was ok though, almost a natural strawberry smell. However, any hope I might have had was brought crashing down upon tasting it. Kumi commented that it tasted like bad strawberry medicine. I thought it was not unlike a McDonald's strawberry milkshake with 100 times the sugar added. Gross. 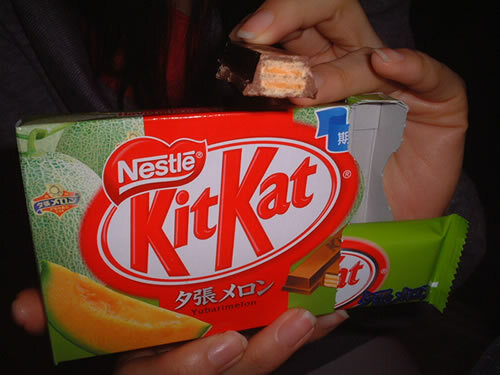 If you think that melon is a strange flavour for a Kit Kat, you're not alone. I was sure that it was going to go down in flames but was pleasantly surprised. The melon flavour was light and didn't have a chemical-like taste. Kumi on the other hand hated it, and thought it stunk. I never was a big fan of white chocolate, and making a white chocolate Kit Kat doesn't change my opinion at all. Kumi however is a fan, and loved it. Most of you have probably tried white chocolate at least once so what can I say? 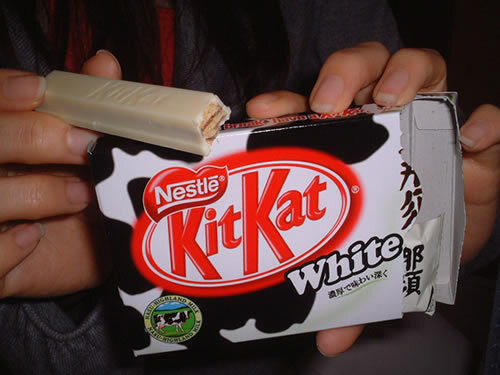 It's white chocolate, and it's a Kit Kat. Besides original, bitter is the only other flavour I have tried before this test, so I knew what to expect. Myself, I quite like dark chocolate, but once again, Kumi and I disagreed, and she gave it a thumbs down. The newest flavour on the market, arriving just in time for the annual cherry blossoms which should start blooming soon. Once again we've got pink bars.... 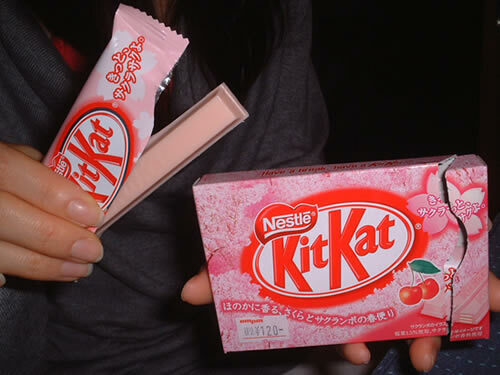 Although I love watching the cherry blossoms bloom here in Japan, the same can not be said for cherry flavoured Kit Kats. Is that cherry? Dunno, but whatever it is, it's pretty sickening. Kumi and I both agreed and couldn't even finish one stick. You thought strawberry was bad? I think we've found the loser. Kumi got me some extra special Kit Kats for Valentine's day when she heard about my Kit Kat collecting project. 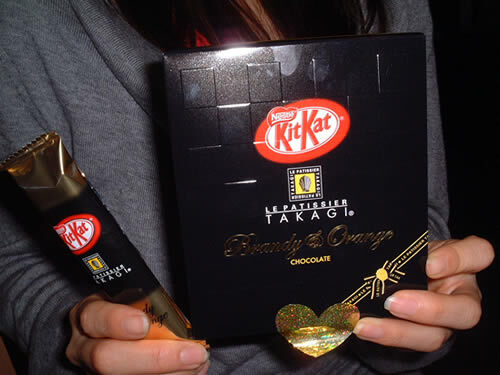 The first box is orange and brandy Kit Kats. Filled with real brandy and orange cream, this is not your everyday $1.00 crappy chocolate bar. Kumi and I both have to admit, it's better than the original! Quite a feat. 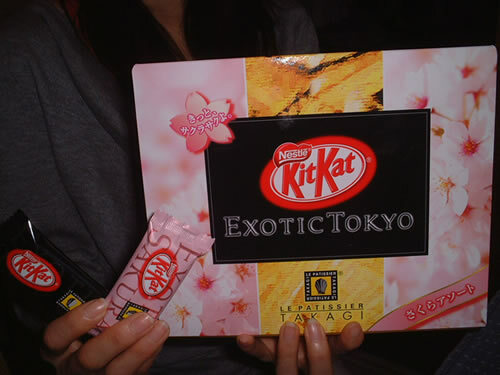 As well for Valentine's, an even bigger box of 'Exotic Tokyo' Kit Kats. Tokyo lost its exoticness a long time ago as far as I'm concerned, but who knows, maybe this will help bring it back? 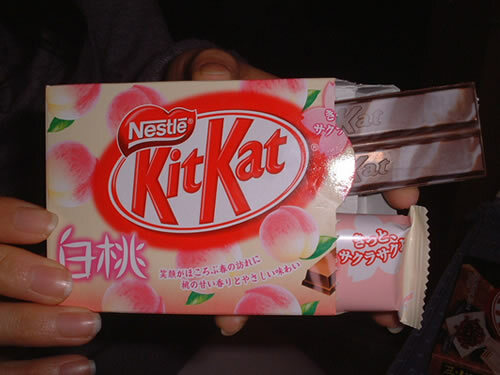 Inside were two different flavours: sakura (=cherry, again? Groan....) and raspberry/cherry/passion fruit/black currant/etc/etc all mixed together in some kind of crazy fruit riot. Luckily though, the cherry in this package was not the cherry above. Obviously some care was taken in choosing ingredients this time and they decided not to include essence of cough syrup and cherry a la chemical. The fruit mix I thought was only so-so, having a kind of sour fruity taste, although Kumi liked it. However if you ask me, it didn't manage to put the 'exotic' back in front of Tokyo. Well looking at the results it's pretty obvious that the lesson to be learned is that except for really well made spinoffs (like brandy and orange), don't mess with tradition. Also that adding fruit flavour to chocolate bars is generally a bad idea. However, what is even more obvious to me is that I'm not a kid anymore, and eating 2 and a half Kit Kats for breakfast is not the greatest way to start your day.